There are many types of flat roof solutions. All have their benefits and their drawbacks, including the ease of flat roofing installation. With all types of flat roofing installation, you must ensure you have a clean flat roof, free of any debris. Although some of these flat roof installation projects are easier than other forms of roofing, you should consider hiring a qualified contractor to ensure the job is done right. A flat roofing installation will likely also involve repairing the roof bed, assessing for damage and installing flashing and vents. Modified bitumen is half-way between BUR and rubber roofing, as it is largely made of tar products, but is considered to be a roofing membrane. There are two main types of a modified bitumen flat roofing installation – torch-down and peel-and-stick. 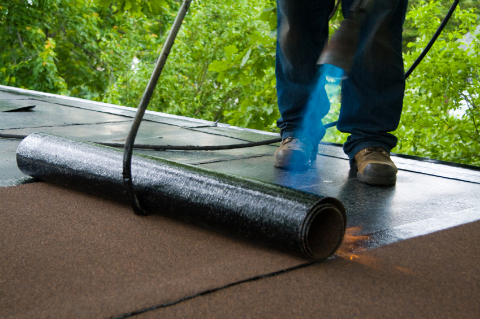 Torch-down involves using a flame torch to heat the underside of the roofing roll, and pressing it onto your roof. Peel-and-stick is a lot safer for a DIY flat roofing installation. PVC or vinyl roofing rivals rubber roofing for best in show. Although similar in price and concept to rubber roofing, it is not suitable for a DIY install. This is due to the heat-welded seams which provide strong protection against leaks and make this roof covering great for rooftop gardens. In a PVC flat roofing installation, there are three methods of adhering the material to the roof deck. All methods include heat-welding. Rubber roofing is quickly becoming the flat roof of choice. Although much more expensive than the other major types, it is longer lasting and the easiest to install. To perform a rubber flat roofing installation, you essentially apply an adhesive to your flat roof and roll on the rubber membrane. Spray foam roof installation should only be performed by a qualified professional. Although the process appears fairly simple (mix chemicals, spray upon roof, add UV protective coating overtop), it takes a skilled hand to achieve the proper temperature, chemical ratio and thickness of the foam. Tar and gravel roofing, also know as built-up roofing, consists of a waterproof base layer, several layers of roofing felt glued together with tar, and a layer of gravel overtop. Although it is fairly straightforward to install, it is not recommended as a DIY flat roofing installation. It is very smelly, and hot tar has been known to burst into flames which can cause severe burns.